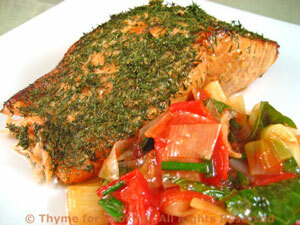 Thyme for Cooking's Main Courses: Grilled Salmon, Barbecued Steak, Salads. Get any steak suitable for your budget and for grilling. If you slice the steak, at an angle, even a tougher cut is delicious - and they usually have more flavor! Combine ketchup, Worcestershire, vinegar, oil, garlic and oregano. Spoon on both sides if steak and allow to marinate for 15 - 30 minutes. 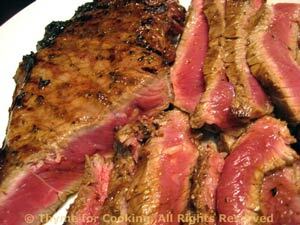 Cook steak on barbecue grill over direct heat for 5 - 9 minutes per side - or until done - 140F (60C) for rare. Use thumb test, meat thermometer or, as last resort, by slicing into center and looking. Slice at an angle about 1/2 inch thick (1.25cm) and serve. Note: Can be cooked under broiler - start with 7 minutes per side. Grilled chicken and a yogurt dressing keep the calories down on this salad; the Parmesan and the anchovies keep the classic 'Caesar' flavor high. Mix chili powder, Worcestershire and garlic. Cook chicken on barbecue grill or sauté in a nonstick skillet, 7 - 8 minutes per side, or until done. Put mustard, lemon juice, vinegar, Worcestershire sauce and yogurt in small bowl and whisk well to combine. Stir in garlic, Parmesan and anchovy paste, if using. Dressing should be thick. Add chives and set aside. Toss lettuce with some of the dressing. 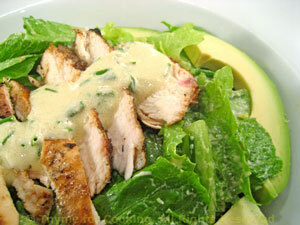 Arrange chicken and avocado on top. Drizzle a bit of dressing over all, sprinkle with Parmesan and serve, remaining dressing (and anchovies) on the side. At first glance it seems like a lot of ginger in this recipe - both on the chops and in the sauce. But it works well, adding an underlying flavor that is not too 'ginger-y' or particularly hot; just a tiny kick.... When you are marinating meat it helps to poke it with a fork, to let the marinade penetrate. Mix all ingredients for marinade and pour over chops. Let marinate for 15 - 20 minutes. 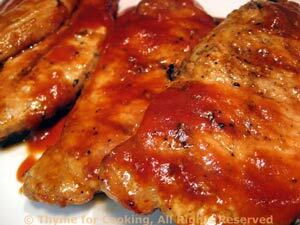 Cook on barbecue for 5 - 8 minutes a side or until done basting each side with barbecue sauce. Should be slightly pink in the center or near bone when done - take a peak (techniques). Or fry in nonstick skillet over medium-high heat the same amount of time. Serve, with Ginger Barbecue Sauce on the side. Heat all ingredients in a small saucepan, whisking to combine. Bring to a simmer just long enough to combine all ingredients. 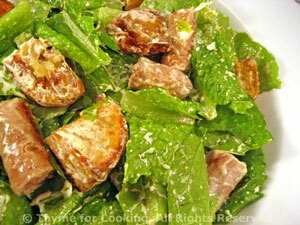 The warm potatoes and sausages melt the creamy goat cheese, coating the lettuce with a flavorful dressing. Use any flavor sausage you like; I used pork with olives. Cut potatoes into bite size pieces and coat with the olive oil. Either cook in a pan on the barbecue if you are using it or put on a baking sheet in a 400F oven for 25 minutes. Cook sausages - either on the barbecue grill or in a frying pan on the cook top. Tear lettuce and put in a large bowl. Tear large basil leaves, leave small ones whole. Combine garlic, lemon juice, mustard and vinegar in bowl and whisk well. Slowly drizzle in olive oil whisking constantly so that the dressing emulsifies (gets thick). Add 1/4 of the vinaigrette to lettuce and toss to combine using tongs (or salad utensils). When sausages are done cut into bite size pieces and add to lettuce - they will be warm. When potatoes are done add to salad - again, warm is okay - not necessary, but okay. Add the chevre to the salad with a spoon - just in small chunks. Add about 1/3rd more of the dressing and toss well. As you toss the salad you will see the residual warmth from the sausage and potatoes combined with the dressing cause the chevre to coat the lettuce leaves, making a very creamy salad. Add more dressing as you like, using all of it or reserving some to be added at table. Fresh pepper is also nice..... serve. In small bowl whisk together Worcestershire, vinegar, lemon juice and oil. Put chicken breasts in glass baking dish and pour marinade over. Let marinate for 10 - 20 minutes or up to 2 hours. 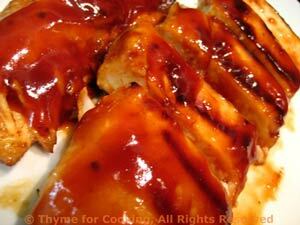 Cook on barbecue grill for 8 - 12 minutes a side or until done (test - take a peak), basting with Barbecue Sauce. OR sauté in nonstick skillet for 8 - 10 minutes a side until nicely browned and done, basting with sauce.